“He’s My Secret Passion.” Composed by Arthur Young, with lyrics by Val Valentine (1930). Recorded by Elsie Carlisle with orchestral accompaniment (probably under the musical direction of Jay Wilbur) c. September 3, 1930. Imperial 2333. “He’s My Secret Passion” was written for a British crime drama called “Children of Chance” (1930) starring Elissa Landi and John Stuart. 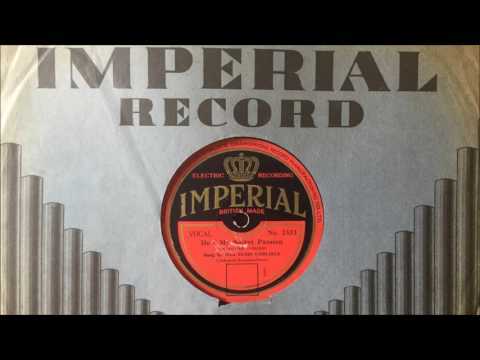 Elsie Carlisle’s September 1930 versions of the song appear on Imperial 2333 mx. 5464 with the take numbers -3, -4, and -5, and discographers Richard Johnson and Ross Laird have deduced from the high take numbers that recording spanned over more than one session. Elsie had begun to record for Imperial, where Jay Wilbur was musical director, the previous month after a four-month hiatus following the closing of Dominion Records (whose music Wilbur had also supervised). One might reasonably call “He’s My Secret Passion” a torch song, insofar as it involves a longing lament over an unrealized romance, but the lyrics involve enough amorous boasting (e.g. “I’ll burn him up when I sit on his knee”) that perhaps the song transcends the genre. Elsie conveys her yearning with a slightly quavering voice, and her delivery becomes more confident as the argument of the lyrics becomes stronger. The studio band plays in a subdued and mellow fashion, nicely showcasing Elsie’s voice. 1930 saw British versions of “He’s My Secret Passion” (often turned into “She’s My Secret Passion,” as suggested in the original sheet music, when sung by male vocalists) by the Rhythm Maniacs (vocalist Ella Logan), Ambrose and His Orchestra (Sam Browne, vocalist), the Four Bright Sparks (vocalist Queenie Leonard, with Arthur Young on the piano), Harry Bidgood’s Broadcasters (Tom Barratt, vocalist), Bert Madison and His Dance Orchestra (Nat Star, again with Tom Barratt doing the singing), Len Fillis’s Phantom Players (vocalist Al Bowlly), and Jay Wilbur and His Band (with Les Allen as vocalist). In America, the song was recorded in 1930 by Doris Robbins, Danny Yates and His Orchestra (with vocals by Smith Ballew), Lee Morse and Her Blue Grass Boys, Marion Harris, and in February 1931 by McKinney’s Cotton Pickers (with vocals by Donald King).